Uphill Farm maintains one of the largest herds of rare Red Belted Galloways in the world. Like other red breeds, this characteristic is more heat tolerant. We also have a fine herd of Black Belted Galloways, a few choice Dun Galloways and the largest herd of White Galloways in the Northeast. Our cattle have been a success in the showroom, and we have bred Platinum, Gold and Silver Lifetime award winning cows. Galloways are the earliest cattle known to have been bred purely for beef as supposed to for milk and work. Originated from Celtic stock, galloways were bred in south-western Scotland. By the late 18th century, the white belt, which gives the "Belties" their names, are first attested in Scottish and Northern English herds. While the exact origin of the belt is shrouded in obscurity, its most likely explanation is that it improved the visibility of the cattle on the long drives from Scotland to the meat market in London. Watching the herd on a foggy day in Clinton Corners lends credibility to this interpretation. Belted Galloway have always distinguished the parks of stately homes in England and Scotland. In the United States, Galloways were first introduced in the 19th century, where they adopted well to the climate and pasture. 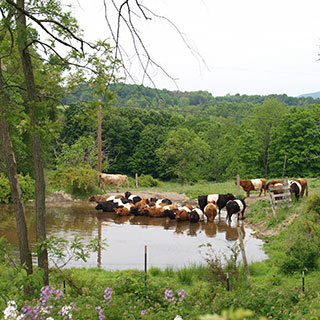 The historic Dutchess County was an important center for the development of pure-bred cattle in America, and Uphill Farm is proud to continue this distinguished history with its herd of Belted and solid Galloways. 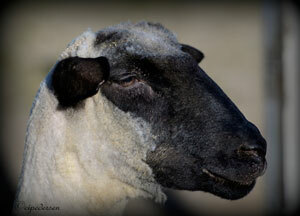 In recent years, we have built a strong program of Romney sheep. Uphill Farms small flock of championship-winning Romney Sheep is being cared for by Mary Stephens and Helena Kagan. They attend many local shows, and Helena is a member of the local 4H Club Southern Shepherds.